The modern horror anthology has seen a bit of a revival in recent years. The likes of The Year’s Best Dark Fantasy and Horror, Best Horror of the Year, Best New Horror etc, etc have all vied for our attention but anything with Johnny Mains in the editors chair is a guarantee of quality. 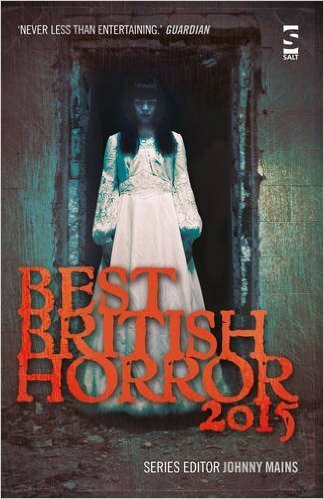 The first volume of Best British Horror was published in 2014 and it instantly became a favourite. Now it’s time to dig into this years collection and see whats on offer. This years anthology consists of twenty-two short stories covering, just about, every spectrum of the genre, from subtle ghosts to less than subtle dog murderers. Stylistically it’s a perfect example of how the horror genre can deal with the mundane, the exciting, the politically relevant and the totally bizarre and turn them all into entertaining reads. With 22 stories on offer I’m not going to summarise them all but rest assured there isn’t a bad one in the bunch. Of course, like any anthology, your preferences will vary dependant on author and style, your top choices may differ from mine but I defy anyone to read this collection and not come away with a list of winners. For me the outstanding tales, as opposed to the mere great tales, included Learning The Language by John Llewellyn Probert with its references to Welsh paganism. The Third Time by Helen Grant which is a clear descendant of M.R. James’s subtle horror style. Alsitair by Mark Samuels manages to expand the qualities of the simple ghost story by inferring a much darker evil. On Ilkley Moor by Alison Littlewood brings to life the ancient Yorkshire landscape while Gary McMahon’s Only Bleeding is firmly rooted in the all too real tragedies of modern austerity. For me though, The Rising Tide by Priya Sharma, was the outstanding story in this collection. It had everything, tragedy, suspense, intrigue and shocks. I should also point out the editors excellent tribute to Graham Joyce who sadly passed away in 2014. The inclusion of one of Joyce’s excellent short stories, Under The Pylon is a fitting tribute. It’s the job of an anthology like this to showcase the value of the modern horror short story. The importance of the short as a format is as relevant today as ever. It’s often the perfect format for getting a message across but it requires a skillful author to create a plot and characters that can hold the reader’s attention in such a short piece of writing, luckily this collection showcases those talents to the maximum. It’s always a delight to find new authors among the more established ones and again this collection fulfills that requirement and even manages to squeeze in a couple of comedians to the mix (Sara Pascoe and Reece Shearsmith), both of whom produce excellent work. With the name of Johnny Mains on the cover being a guarantee of quality, I didn’t expect to be disappointed but once again he has managed to produce an anthology which surprises, satisfies and scares, what more do you want.